If you can’t get rid of persistent stains on your grill you’ll probably need to get a grill cleaner - today I take a look at some of the best ones for you! Grilling in the yard with your friends is a joy! I was deprived of it for years when I used to live in an apartment, but now that I’ve got my own yard I can do it as much as I want! However, as I’m single, that means that most of the cleanup is left up to me - my friends only clean up the food from their plates. Grills are notoriously difficult to clean, and I’ve ruined a few by trying to get the most persistent stains off them. Luckily, that all changed when I started using grill cleaners – cleaning fluids designed specifically for keeping grills in tip-top shape. Today I’ll tell you about everything I found out over the years and give you my thoughts on some of the best grill cleaners you can find! Let’s get to it! What is a Grill Cleaner? The first thing you might ask is – what even is a grill cleaner? Why would I get it instead of using any old type of cleaning fluid I have? Those were my thoughts as well a long time ago – but that was before I ruined three grills, one of which was a friend’s tailgate grill, by trying to clean them with whatever I had lying around. Are you looking for a new grill that will up your barbeque game? Take a look at our thoughts on the best 2-burner gas grills, and you might find the right one for you. Grill cleaners are simply cleaning liquids which are designed to be able to deal with heavy greases build up while not damaging the material your grills are made of. They’re also made to be food-safe, so you can clean without worrying about poisoning your quests on your next barbeque. With a grill cleaner, you’ll need to scrub less, and you’ll be able to keep your grill shiny and safe while ensuring it lasts for a long time. That’s about it. Even when you’ve got a good grill cleaner in hand, your grill won’t magically look like new overnight. You should make sure you’re cleaning it properly to get the most out of the grill cleaner you bought. They say that experience is simply the name we give to our mistakes and in that case, I’ve got a ton of experience! If there’s something wrong to be done while cleaning your grill (including burning down your neighbor’s fence) I’ve done it. If burning charcoal is not something you want to do – we completely understand, it’s just messy and inconvenient. That’s why you should get yourself an electric grill and keep barbequing the safe way! But I’ve also learned from all that, and I’ve got quite a good routine going these days. I haven’t burned down anything in years! To cut to the chase - here’s what I know about how to clean your grill the right way. If you want to clean your grill as thoroughly as possible, we recommend using a grill brush. Read our thoughts about the best ones you can get and find one you’ll like! Once you’ve got everything ready, you can start the cleaning process. I’ll go through it with you, step by step. Yes, fire up the grill to the maximum temperature and leave it on until it stops smoking. This is something you should do to burn off all the excess grease and food left on the grates. Turning all of that into ash will make it so much easier to clean. After you’re done, let the grates cool off for a while, until they’re no longer hot to the touch. Then, you can move on to the next step. Unhook the gas supply or unplug your grill from the outlet. Then, remove the grates from the grill and place them to the side. Fill the bucket you have with lukewarm water and put the grill cleaner in it and mix it up a bit until it’s foamy. Take the grills and scrub them off a bit with the large brush, then place them in the water. You’ll return to them a bit later. You can repeat the same process with the panels located beneath the grills. Take your vacuum cleaner and vacuum up all the excess food and ash particles from your grill. Using a handheld vacuum is the best, but a regular one will do the job. Remove anything that might be covering the burners and scrub them clean using the brush and the sponges. Soak them in the water that’s full of your grill cleaner. You can also clean up the bottom of the grill and inside of the lid while you’re at it. Now scrub the outside of the grill thoroughly, mostly with a sponge. If your grill has a grease collection tray, you can also drain it and clean it right now. Once the grates have finished soaking, take your brush to them and scrub them clean. Use the larger brush for surface scrubbing and getting rid of the really stubborn stains, while employing the smaller brush to clean all the nooks and crannies. When you’re done, wipe down the grates with a dry cloth. Assemble the grill back together and give it another wipe down with a dry cloth. You should be all done right now! Try and do this after each use of the grill. Yes, it’s a bit tedious, but it will save you a lot of time and money in the long run. You should also avoid using abrasive cleaning solvents or steel wool since they can damage your grill. If you’ve never shopped for a grill cleaner in your life, don’t be too intimidated - it’s rather simple. Here are some guidelines to help you get the best one you can find. This is the first thing you have to consider before looking at anything else about the grill cleaner you want to buy – is it good at cleaning grills? If it’s not, nothing else matters all that much. However, it might be difficult to check how effective a grill cleaner is, especially when buying online. Demonstration videos are not too helpful since they’re usually made by the company selling the product. Well, I learned quite early in my single life that I should always check out user reviews before buying anything on the internet. That’s where you can find the best info. Reviews from experts are also useful, and you should definitely try to find more than a few different experiences for a variety of sources before you make the final decision. The ingredients of a cleaning solution are important for a few reasons, the first of which is safety. You’re going to put food directly on your grill, so cleaning it with something toxic is not a good option. Even if the ingredients are not severely toxic, you should check if there’s something in the solution that someone you know is allergic to. You don’t want to accidentally feed them chicken breasts that will make them break out in hives. You should also make sure that they contain ingredients that might produce toxic fumes when you fire up the grill. Keep in mind that, while some ingredients are not toxic on their own, they can still produce toxic fumes at high temperatures. Always check the label and make sure you’re buying a safe and environmentally friendly product. One of the main reasons why people hesitate to buy a grill cleaner is simple. They don’t need to clean their grills all that often so buying a cleaning solution just for that seems like a waste of money. Luckily, most grill cleaners can also be used to clean other things around the house or the yard. Some have a limited amount of uses, but others are incredibly versatile. I prefer to buy ones that can clean as many things as possible – I used some of them to clean my microwave, my oven, my dishes, and my wood floor. It was great at all of those things, better than my oven cleaner while being amazing for cleaning my grill - the best of both worlds. Of course, the price and your budget are important. The amount of cleaning fluid you get for the price is important, especially if you’re looking to save money. 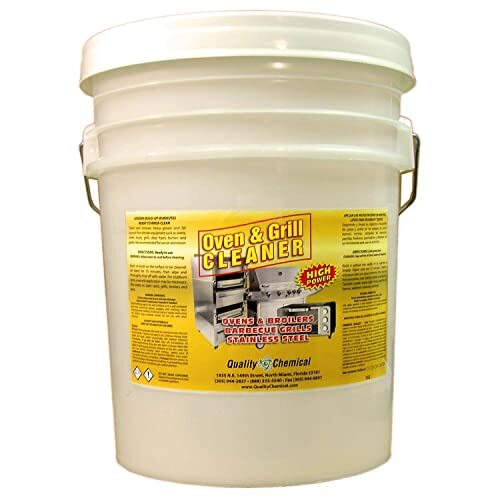 Luckily, most grill cleaners come in rather large containers, and since you can use most of them for cleaning other things, you’ll usually get a good deal. Still, you should always check how much you’re getting and compare it to the price tag. There’s one thing you can’t deny when it comes to this cleaning solution – it’s incredibly versatile. It can be used for cleaning almost anything you can think off, from dishes and wood floors to brick walls and even your car. While not necessarily a grill cleaner, it works great, and you get a ton of it for a decent price. It’s particularly good for cleaning out grease, and it dissolves it with ease. All of the ingredients are non-toxic, and it’s completely safe – in its regular form. The fumes from it can be dangerous though, so you should watch out and make sure your grill is thoroughly scrubbed after using it. You also shouldn’t use it to clean your grill inside a closed non-ventilated garage, for example. Besides that, there’s nothing wrong with it, except that it doesn’t smell all that great. This is an easy-to-use, spray on type of grill cleaner, and it works great when cleaning the grease off your grill. Even caked on grease cleans off easily. However, you do need to use quite a lot of it to get the job done properly - and you don’t get a lot of it in the package. Luckily, it’s fairly cheap to compensate for that, so it’s not a huge problem. The bottle it comes in is a bit shoddy though, so watch out. It might spill from the sides when you’re trying to spray it on, and the top can come off entirely. Unlike most of these grill cleaners, it doesn’t leave a horrible smell afterward. It also seems to be safer than most and doesn’t have any toxic fumes - or they’re not as pronounced. Overall, it’s a decent product, and if you’re worried about bad smells or toxicity, this might be the right one for you. For starters, this is an amazing value proposition – 5 gallons of grill cleaner for a price this low? That seems like a steal and it is, but it does tend to make you suspicious, at least at first. 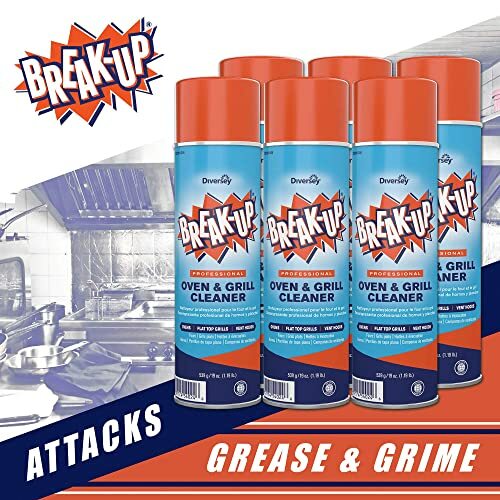 Don’t be afraid though – it works well, and it cleans built-up grease easily. It does it easily and quickly. It’s also non-toxic and doesn’t smell bad like a lot of these cleaning solutions do, especially the cheaper ones. However, there are some problems with it. The first major issue is that you need to use a lot more of it than you would any other cleaning solution. You do get a 5-gallon bucket, but it’s still a concern. The other problem is that it’s slightly abrasive, so it might scratch your grill, especially if the grates are made of porcelain, so watch out. Besides that though, there’s nothing about it that’s too bad, and it does the job admirably. The best thing about this cleaner is that it works incredibly quickly! It can get rid of nasty stains in just a few minutes or less, which is great. It can be used for ovens or regular countertop cleaning as well. While it works well for spot cleaning, it is also good for deep cleaning, and it deals with old, persistent stains without a problem. It holds up well against old grease on the grates as well. However, it’s not quite safe. The fumes are toxic, and they smell incredibly bad. If you have asthma, don’t use this without wearing a mask of some sort. Also, keep your children and pets away from the fumes. It works well and won’t damage your grill, but it is far from being safe. 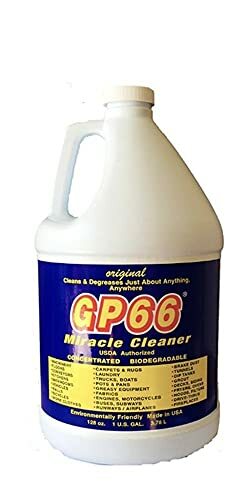 In this package, you get a total of six cans of this cleaner, and you get them at a great price. However, is it any good? Well, yes, it is. It can clean off both recent stains and those that have been there for a long time. If your grates are encrusted with age-old grease, you don’t need to worry, you just need to spray this on, and you’re ready to go. With it you also don’t have to prepare a mixture in a bucket and let the grates soak – just spray it on the grates and scrub them, easy as pie. The issue is that it isn’t quite safe and it smells incredibly bad, as is often the case with these cleaning solutions. Be careful when using it, clean the surface thoroughly and you should be fine. Usually, it’s quite difficult for me to pick just one product. I’ve used all of these over the years and on different grills, which makes the decision even more difficult. It was hard for me to even narrow this list down to a top 5! However, after a lot of thought, I think I’d have to go with Quality Chemicals Oven & Grill Cleaner since it works well and you get a ton of it in the package. It’s also safe, fairly versatile and doesn’t have any major disadvantages. It’s the one I use most of the time these days. That’s my final decision, and I’m sticking to it like grease to a grill! What are your thoughts on the matter? Feel free to post them in the comments - or ask me about anything that comes to your mind! I’ll try to answer them all as quickly as possible. Thank you for reading, and I hope I’ll see you here again soon!